Although it seemed unlikely coming into Sunday, and even more unlikely several weeks out, we all kind of knew this would happen. The Nick Foles-led miracle Eagles have scratched their way back into the playoffs, edging out the Minnesota Vikings for the NFC’s second Wild Card spot. This could only happen with some added help from, well, the Vikings, alongside a 24-0 victory over a putrid, wilting Washington team. Foles was gifted a Week 17 matchup against Washington, who’ve been sputtering along in the lower reaches of the depth chart since Alex Smith suffered a possible career-ending injury in Week 11. 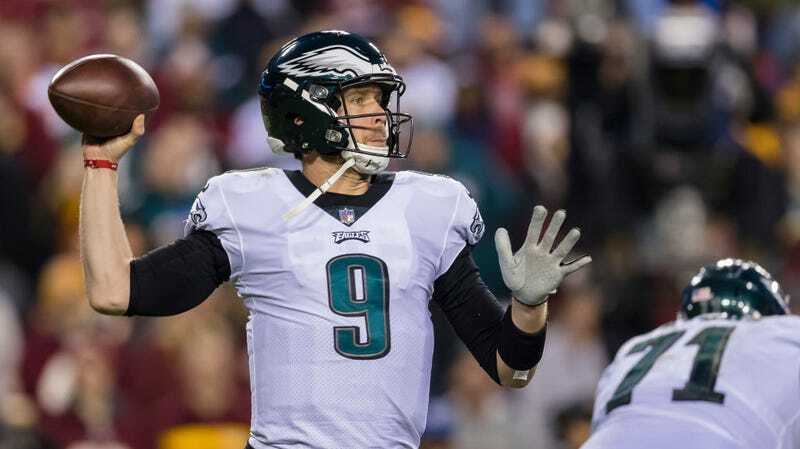 On Sunday, Foles followed last week’s 471-yard, four-touchdown victory against the Texans with a more surgical outing. He bounced back from a first quarter interception to eventually fire off 25 consecutive completions, tying the NFL record set by Philip Rivers and Ryan Tannehill. Josh Johnson and the Skins couldn’t get anything going on Sunday, with the third-stringer finishing 12-27 with 91 yards and a pick. Decimated on both sides of the ball by injuries, Washington rarely found themselves in enemy territory. 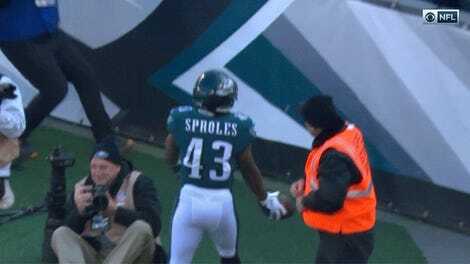 There was one hiccup along the way, when Foles left in the fourth quarter with bruised ribs, but even third-stringer Nate Sudfeld managed to throw a 22-yard TD on his only pass. The supporting cast is also coming up when it matters, like this tumbling sideline catch from Alshon Jeffrey, which he would eventually follow up with a two-yard TD catch before the half. The Vikings, who the Eagles violently dismantled en route to a Super Bowl win last season, looked nearly as lifeless against a stout Bears defense, falling 24-10. Intense weenie Kirk Cousins just couldn’t find his top wideouts for large enough chunks of yardage, with the backsliding Adam Thielen corralling just three of four targets for 38 yards. It’s a game that will probably be remembered more for Cousins lecturing his star players on the sidelines than for producing any meaningful result. The Bears were in the strange position of essentially being able to choose their round one opponent in the playoffs, and by leaving Mitchell Trubisky in for the whole game suggested that they wanted the Eagles. I’m not sure that the personnel would’ve changed much, given how few productive drives Cousins could string together against the defense. Postgame reports suggest that Foles will be Okay and good to go for the playoffs, if there was ever any doubt. It doesn’t seem possible that the same team who was just pilloried by the Saints last month could have a chance for revenge in New Orleans next month, but it seems like every improbable option should be on the table with this guy. Here we go again.